In case anyone needs a refresher: The Care Bears were created in 1981 by American Greetings (originally for greeting cards, of course), and eventually starred in their own TV series and animated movies (produced by Nelvana) before they went on to conquer the world of tie-in marketing entirely. Well now the entirety of that original animated series is available in a -DVD box set (!) 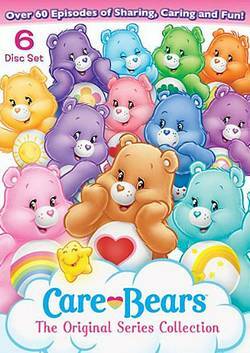 called Care Bears: The Original Series Collection. “The lovable bears of Care-a-lot, Cheer, Share, Harmony, and all their bear buddies with unique belly badges and a caring mission have been delighting fans for 30 years! Whether it1s learning the value of friendship, helping someone in need, or using their special powers to brighten up the day, the adorable Care Bears are always ready for caring, sharing, and giving goodness!” The set is available now from Miramax/Lionsgate.